WHITE STUFF is a fashion company that believes in making a difference and puts ‘happiness in every stitch’ of what it does. You might think you’ve seen these prints somewhere before. Maybe on that top you love or that dress you wear everywhere? That’s because the White Stuff ‘Made for Change’ bags use up spare fabric from the same rolls used to make their signature clothing range. And that’s not all. Every Made for Change bag raises money for an educational scholarship scheme, supporting workers’ children in India. Grace is one of the students on the scholarship; watch how the initiative has helped her. Although schooling in India is free, workers at the factory in Bangalore can spend a high proportion of what they earn on transport to school and supplies. The White Stuff Foundation works with ID Care (their supplier’s charity) to fund scholarships for children from the poorest families. So far more than 330 children have benefited from the scheme. All of this wonderful stuff from a bit of excess fabric! 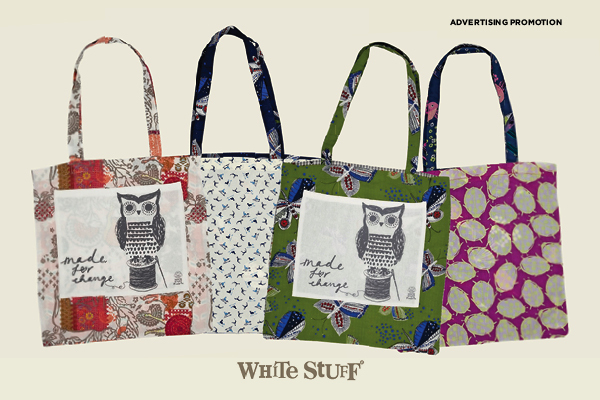 The bags will be in shops and online at www.whitestuff.com from November; the perfect time for stocking fillers! For a recommended donation of just £3.50 each, you could even use them instead of wrapping paper to make your other pressies look pretty. Don’t you just love it when simple things make sense? Read more about this and other projects at www.whitestuff.com.